Is Microsoft Exchange Server an integral part of your organization? 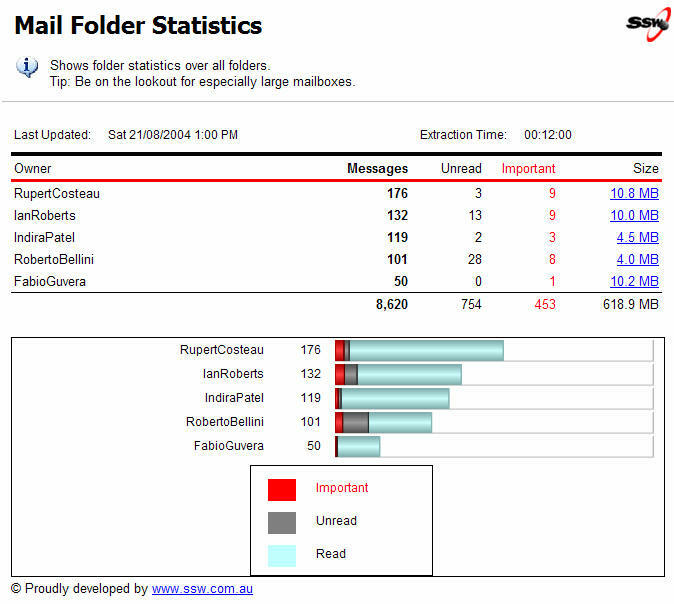 If so, SSW Exchange Reporter provides the tools and reports you need to efficiently analyze your organizations email usage. Built in Exchange reports range from who is sending the most emails, to who has the largest mailbox. As new emails are sent and received, to and from your exchange server, our lightweight windows service seamlessly extracts email messages and folder statistics to your fast SQL Server backend. By taking advantage of SQL Servers Reporting Services, the generated reports can easily be customized and extended while being viewed securely from anywhere. That is why experts say that SSW Exchange Reporter is the most powerful and the only flexible solution to understanding your organizations communications. Question: How can I test it without having Exchange Server? How many emails each Exchange user has sent internally, externally or to clients? Who is sending the most emails in your organization? Who is using email the most effectively? What amount of time is being spent on email by our staff? How many emails were sent to a particular client? Screen email subjects and body content for inappropriate content? 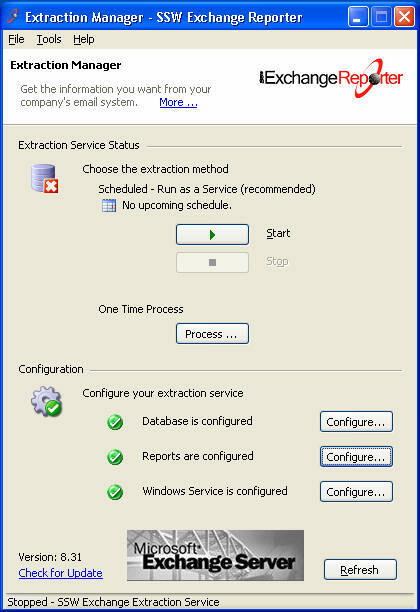 SSW Exchange Reporter runs as a Windows Service in the background on your Exchange Server and periodically retrieves data from users' mailboxes and stores it in a SQL Server database for fast and efficient report generation. Reports are hosted by SQL Reporting Services and can be viewed by any user with a web browser. Reports can also be configured to automatically 'push' themselves to users' mailboxes according to a schedule, ensuring that all the necessary people in your organization are kept up to date with the latest statistics. We have included a number of sample reports that will run with your SSW Exchange Reporter database. These can be seen in the following link: SSW Exchange Reporter (Samples). This 'Online Reports Demo' includes all reports screen shot. SSW can assist in the creation and customization of Exchange Reporter reports. To find out about our consulting services at competitive rates and high quality development standards, please don't hesitate to contact us. Q: How do I get access to all the mailboxes in Exchange 2003? A: How to Assign Service Account Access to All Mailboxes in Exchange Server Microsoft Knowledge Base Article - 821897 . Microsoft loved this tool so much they put a cut down version of this on their websites SQL Server 2000 Report Pack for Microsoft Exchange on the Microsoft Website . SQL Server 2005 Report Pack on the GotDotNet Website .